347 Items. Showing Items 1 thru 9. Anna Harrison (1775 – 1864). First lady during the one month term of William Henry Harrison. Grandmother of Benjamin Harrison and William Henry Harrison (1773 – 1841). Ninth President of the United States. ALS. 1 page. 7 ½” x 9 ¾”. Northbend, Sept. 19, 1850. 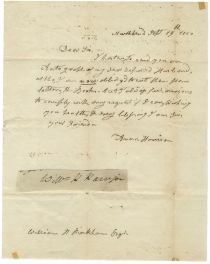 An elderly Mrs. Harrison sends a cut signature of William Henry Harrison to William Pinkham, an autograph seeker; “Dear Sir, I haston to send you an autograph of my dear departed husband, tltho, I am now oblidg’d to cut them from letters & books, but I always feel anxious to comply with every request if I can. Wishing you health & every blessing I am sir, your friend. Anna Harrison.” Anna has attached to the letter a signature of William Henry Harrison which she has cut from a letter in her possession. One can only wonder if it could have been an ALS as president! 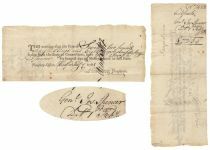 During much of the nineteenth century it was a common practice by collectors to cut signatures from letters and documents and as a result, many great letters and documents of content have been lost forever. Folds. Excellent condition with a couple of light tape stains. A great Harrison item! John Quincy Adams (1767 – 1848) Sixth President of the United States and Henry Clay (1777 – 1852) U.S. Congressman, Senator and politician. Document Signed. February 13, 1826. 1 page. 11 ½” x 15”. Printed on vellum. Passport for the “Brig Quito of New York…of the burthen of one hundred thirty-eight 10/95 tons of thereabouts mounted with no guns…to pass her company passengers, goods and merchandize without any hinderance…” White wafer seal at lower left. 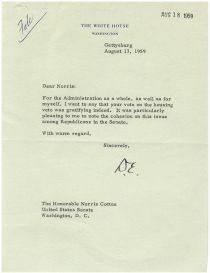 Boldly signed by Adams and countersigned by Henry Clay as Secretary of State. But for a small loss of vellum at left center, this would be considered a choice example. JOSEPH SPENCER (1714-1789). Spencer was an American Major General in the Revolutionary War. He commanded a division during the defense of New York but was defeated while trying to take command of Rhode Island. Document Signed. 1 page. 8 ¼” x 3 ¼”. Hartford, Connecticut. February 7th 1781. Partly-printed note which “certifies that the Sum of seventy-two pounds six shillings and eight pence lawful money is due from the State of Connecticut unto Gen’l. Joseph Spencer for Interest due on Money Loaned to said State. Signed as treasurer by John Lawrence. Spencer has endorsed the note on verso. Simon Lake was a famous American engineer who is responsible for obtaining over 200 patents for his advancements to naval designs. Lake is responsible for engineering some of the first submarines for the United States Navy in the 1890s. Despite both of his first two being denied for use by the U.S. Navy, Lake was able to sell his second model, the Protector, to Imperial Russia in 1904 as well as other European countries afterward. When Lake finally was able to get one of submarines allowed for use by the U.S. Navy in 1912, the submarine set a record for depth at 256 feet. 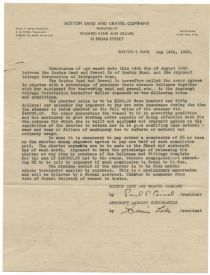 This piece is an agreement memorandum from August 4, 1920 between the Boston Sand and Gravel Company and the Argonaut Salvage Company. 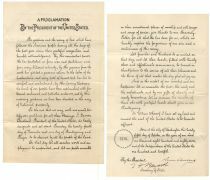 Lake was treasurer of the Argonaut Sand Company initially, and at the time of the signing of this document had become president. The Argonaut Salvage Company was organized to build and equip Lake’s inventions to submarines to trace sunken or underwater goods. 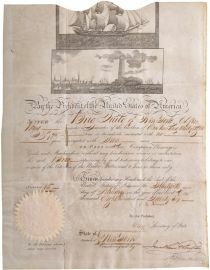 This agreement was for the Boston Sand and Gravel Company to borrow the Argonaut Salvage Company’s steamer to collect sand and gravel from underwater. The piece is signed by Simon Lake in the right hand corner. (Abolitionism) DS. 1pp 8” x 3”. July 12, 1844. Boston A p[partly printed receipt for “The Emancipator and Free American”, it confirms that someone paid for twenty-one copies of the magazine. It is in fine condition. Albany August 2 1771 Sir, I am obliged to you for sending me the Brandy and Biskets. When I wrote the last letter, I intended to have sent it by another person, and when I have it to Mr. Beckham, I forgot the 30 shillings which I intended to send you to pay for the Brandy. I now send you by Mrs. Munro, one pound twelve and six pence for the last things, agreeable to your account. Mr. Bogart’s flour, you remember, I paid for it, just as I was going aboard. I remain Sir, Your most humble servant, Harry Munro To Mr. E. Banker” MUNRO, HARRY (1720-1781) Scottish soldier and politician; Member of British Parliament for Ross-shire and Tain Brughs. Hanoverian dynasty loyalist and served as a Captain in Loudon’s Highlanders Regiment in the 1740s during the Jacobite rising of 1745. Autograph Letter Signed Philadelphia, May 31, 1833. 1 page, 13” x 8”. Postal cover on verso. The letter reads: “Dear Sir, I send you the Release of Dower - will you and your wife please sign it opposite the seals, where I have marked your names in pencil...acknowledge it before the mayor of Trenton, who will put in his signature and city seal...” Dower rights came from the English common law system and were followed in the American colonies, continuing in most states well into the 19th century. The dower right of any validly married woman was established as soon as her husband became possessed of an estate in real property that could be inherited by his children. Some occasional staining; Very Good.